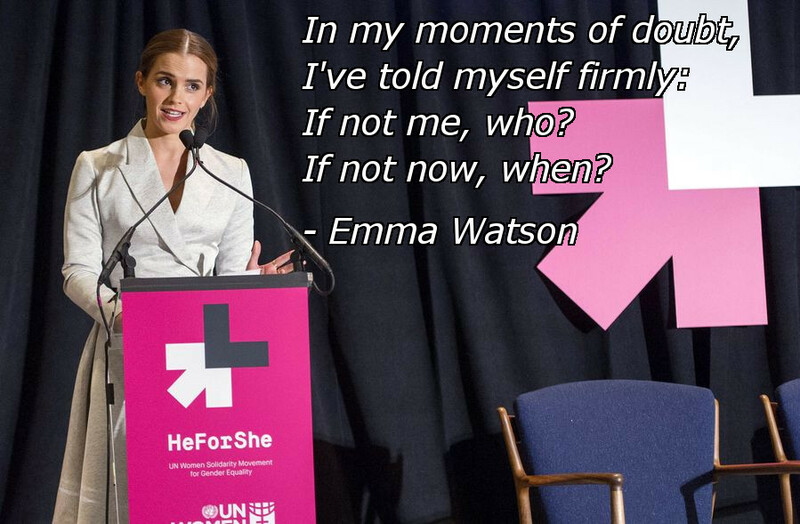 Since today is International Women's Day, what better way to celebrate than by sharing this powerful quote that the former Harry Potter star, Emma Watson, at her speech to the United Nations. Although Emma Watson became famous as her role as Hermione Granger in the Harry Potter series, she has used that celebrity to push for women's rights across the globe. She has since become the United Nations Women's Goodwill Ambassador as spoken powerfully for the equal rights for women in her HeForShe campaign. Emma Watson has willingly put herself as the voice and image of feminism which she admits is often very over-burdening but this quote by her reveals her resolve to keep pushing through for her cause. This quote is powerful enough for all of us to consider even in our lives and for any cause we need to stand up for. Often times we look for someone else to fix issues in our world or our lives but instead we should always ask ourselves why not me? and when? !